Coronary arteriography should be performed in HF who have angina or significant ischemia unless the pt is not eligible for revascularization. BNP or NT-proNBP can be useful in the urgent care setting in whom the clinical diagnosis of HF is uncertain. Measurement of BNP can be helpful in risk stratification. 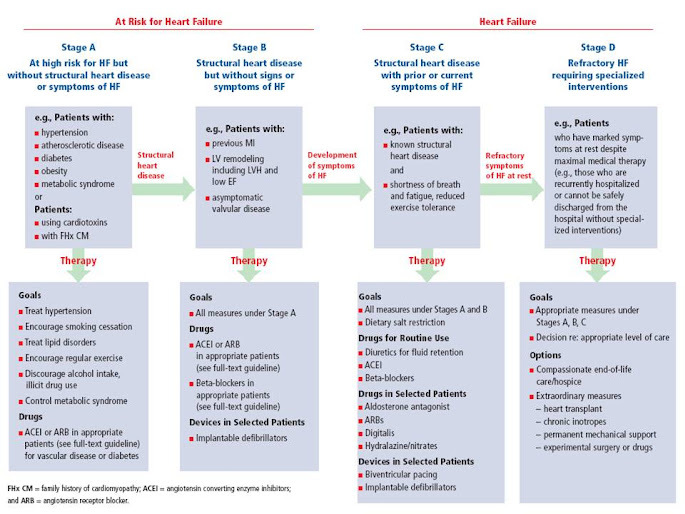 ICD is recommended in pts with of HF and reduced LVEF who have a history of cardiac arrest, VF, or hemodynamically destabilizing VT.
ICD is recommended for primary prevention of SCD to reduce total mortality in pts with non-ischemic DCM or IHD > 40 days post-MI, LVEF ≤ 35%, NYHA Fc II or III while receiving chronic optimal medical therapy, and who have expectation of survival with good functional status > 1 year. BNP or NT-proBNP should be measured in pts being evaluated for dyspnea in which the contribution of HF is not known. In pts with clinical evidence of hypotension associated with hypoperfusion and obvious evidence of elevated cardiac filling pressures (e.g., elevated jugular venous pressure; elevated PAWP), IV inotropic or vasopressor drugs should be administered to maintain systemic perfusion and preserve end-organ performance while more definitive therapy is considered. When pts present with acute HF and known or suspected acute myocardial ischemia due to occlusive coronary disease, especially when there are signs and symptoms of inadequate systemic perfusion. in the absence of systemic hypotension, vasodilators such as IV NTG, nitroprusside or neseritide can be beneficial.